The ultimate product of the long pathway of cosmic evolution is your habitat. This little bit of rock with some unique characteristics is where you were born. It keeps you alive right now and it will deal with your remains after you die. So, it is important that you understand how this pretty blue planet got here and how the unique set of circumstances arose that make your existence possible. Enough preamble let’s sweep back to the beginning of the story: 13.77 billion years ago [see https://map.gsfc.nasa.gov/universe/uni_age.html] the Universe, and all time and space, began with the big bang. 300 thousand years after the big bang, hydrogen nuclei captured electrons, forming the first atoms. 600 million years after the big bang the first galaxies were formed. Most cosmologists believe that present-day galaxies resulted from the gravitational consequences of small variations in the density of matter in the universe. For example, when the universe was one thousandth its present size (about 500,000 years after the big bang), the density of matter in the region of space that now contains, our home galaxy (the Milky Way) might have been 0.5% higher than in adjacent regions. The higher density caused this region of space to expand more slowly than surrounding regions, because of gravitational interactions; and that, in turn, increased the relative over-density. Later, when the universe was one hundredth its present size (around 15 million years after the big bang), our region of space was probably 5% denser than the surrounding regions. This evolution continued as the universe expanded and aged, and when the universe was one fifth its present size (roughly 12.5 billion years ago), our locality was probably twice as dense as neighbouring regions. The inner portions of our Galaxy (and similar galaxies) were assembled about 12 billion years ago. Stars in the outer regions of our Galaxy were probably assembled in the more recent past; our Sun was formed about 5 billion years ago (that is, when the Universe was 64% of its current age). Of course, we can’t see into the ultra-deep time at the birth of the Universe; but the Hubble Space Telescope got pretty close. In March 2004 astronomers at the Space Telescope Science Institute released the deepest view of the visible universe achieved at that time. Called the Hubble Ultra Deep Field (HUDF), the million-second-long exposure (that’s about 16 days) revealed the first galaxies to emerge from the time shortly after the big bang when the first stars started to reheat the cold, dark universe (Figs 1 & 2). The HUDF image was an astonishing portrait of the origin of your habitat. Importantly, it shows that galaxies evolved quickly. Fig. 1. Ultra Deep Field of the Hubble Space Telescope (credit: NASA, ESA, S. Beckwith (STScI) and the HUDF Team). The HUDF is actually two separate images (assembled by Anton Koekemoer) taken by Hubble's Advanced Camera for Surveys (ACS; an 11.3-day exposure) plus the Near Infrared Camera and Multi-object Spectrometer (NICMOS; a further 4.5 day exposure). 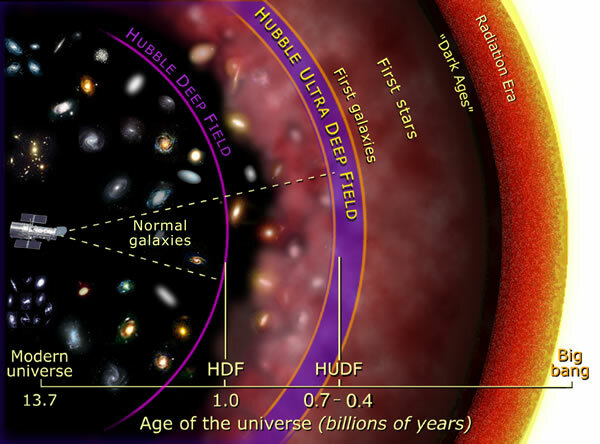 The HUDF field contains an estimated 10,000 galaxies that existed between 400 and 800 million years after the big bang. In ground-based images, the patch of sky in which the HUDF is located (in the constellation Fornax, just below the constellation Orion) is empty to the eye and is even empty to the best ground-based optical telescopes. Image produced by STScI (Space Telescope Science Institute, 3700 San Martin Drive, Baltimore, MD 21218, USA). For further information and images visit http://hubblesite.org. 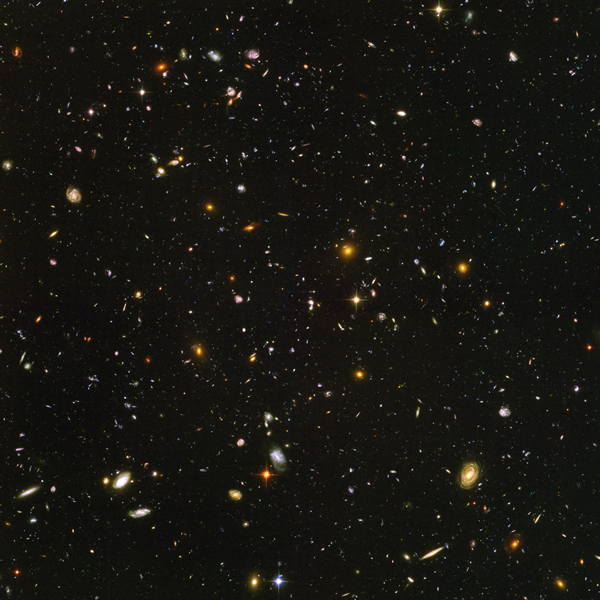 For more information about cosmology, visit Cosmology: The Study of the Universe at https://map.gsfc.nasa.gov/universe/index.html and view the 2012 Hubble Extreme Deep Field at https://apod.nasa.gov/apod/ap121014.html. Fig. 2. This image shows the place of the HUDF data within NASA’s original interpretation of the history of the Universe (note the time axis is logarithmic; image credit: NASA and A. Field, STScI (Space Telescope Science Institute, 3700 San Martin Drive, Baltimore, MD 21218, USA)). In 2013, measurements made by the Wilkinson Microwave Anisotropy Probe (WMAP satellite) enabled the precision of the estimated age of the universe to be improved to 13.77 ± 0.059 billion years. See https://map.gsfc.nasa.gov/universe/uni_age.html. Also, check out the Illustris simulation of cosmic evolution on YouTube at https://www.youtube.com/watch?v=32qqEzBG9OI; and the Space Discovery Documentary How the Universe Works - From The Big Bang To The Present Day on YouTube at https://www.youtube.com/watch?v=dMYmzeZXxMM. The HUDF showed numerous galaxies. Galaxies mean stars. Stars mean nuclear reactions producing an ever-widening range of elements. When the universe was created it was composed of hydrogen and helium, with some lithium, boron, and beryllium. Stars emit radiation, including visible light, as a by-product of the nuclear fusion reactions in their core, which create the more massive elements, such as carbon, oxygen, nitrogen, iron, calcium, etc., by fusing together atoms of the lighter ones. When the star’s nuclear fuel is exhausted the star explodes, scattering its outer layers back into space, adding to the gas clouds within which later stars form. Those later stars will contain more of the heavier elements and will be able to create even more massive elements in their nuclear fusion reactions. Repetitive cycling within stars produces all of the elements of the Periodic Table, but ‘All of the atoms on the Earth except hydrogen and most of the helium are recycled material; they were not created on the Earth. They were created in the stars.’ (Nick Strobel on his Astronomy Notes website at http://www.astronomynotes.com/index.html). The HUDF shows that some of the most important developmental changes happened in the universe well within one billion years of the big bang. In the present universe star lifetimes vary with the mass of the star from about 3 × 106 years for stars with masses around 60 times the mass of the Sun, to about 32 × 106 years for those with masses about 10 times that of the Sun, and on to 109 years for stars of about the same mass as the Sun. So, the first billion years (which is a little over 7% of the total age of the Universe) would have provided sufficient time for several to many star lifetimes. These stellar life cycles would have created, even that distance of time ago, all the elements which became the building blocks of chemistry. And chemistry means evolution. Chemical evolution provides the potential for life.